Although it's sometimes called vitamin H, biotin is actually part of the B-complex family of nutrients, which also include thiamin, riboflavin, niacin, folate, and vitamins B-5, B-6 and B-12. These vitamins work together to benefit health. B-complex vitamin supplements already have enough biotin, so you don't need a separate biotin supplement. However, taking extra biotin won't have any negative effects on the function of the other B-complex vitamins, and it doesn't have any side effects. Taking a supplement that contains all the B-complex vitamins, including biotin, helps ensure that your body has the nutrients it needs to make energy. The B-complex vitamins work together to help your body metabolize carbohydrates, proteins and fats, so that your cells can use them as sources of energy. Biotin, specifically, plays a key role in carbohydrate metabolism. That's especially important for energy levels, since carbohydrates are the muscles' preferred source of energy, and sugar is the sole source of energy for the brain. However, taking more biotin in addition to a B-complex supplement doesn't offer any more benefits for energy rather than just taking the B-complex vitamin. Biotin and the other B-complex vitamins support the health of nerves and blood cells. Niacin, vitamin B-6 and vitamin B-12 all help synthesize red blood cells, the specialized cells that bind to the oxygen you inhale, and distribute it to tissues throughout your body. Low biotin levels also interfere with oxygen transport and cause anemia. The B-complex vitamins, including thiamine and B-12, also promote healthy nerve and brain function. Low levels of certain B-vitamins harm the nervous system – for example, a B-12 deficiency can cause nerve damage. A supplement containing biotin and other B-complex vitamins supports healthy nails and skin. Vitamins B-1, B-2, B-3, B-6 and biotin all contribute to skin health, and low levels of these vitamins can cause skin disorders, like rashes. Biotin might also help strengthen weak nails and hair, according to the University of Maryland Medical Center, although more research is needed to know more about how well it works. 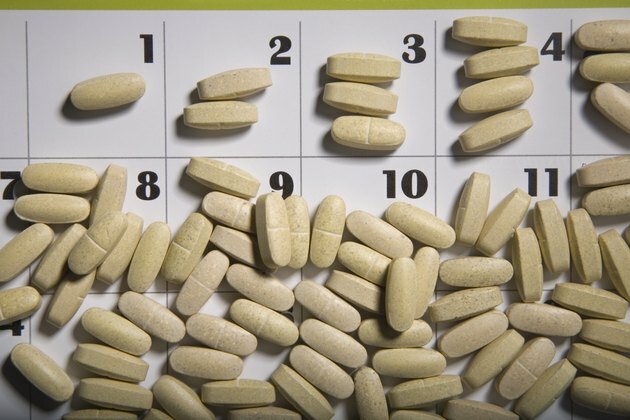 While it's important to meet that the recommended daily intake of each B-complex vitamin, overusing supplements to exceed the recommended intake doesn't provide any additional benefits. Too much vitamin B-5 can interfere with biotin absorption, but a B-complex vitamin has a balance of all the B-vitamins to prevent you from getting too much B-5. You need 30 micrograms of biotin daily – that includes biotin from supplements and food – to meet your needs. However, taking too much biotin, or taking biotin in addition to a B-complex supplement, does not cause side effects, or negatively affect the function of other B-complex vitamins. It's better to get B-complex vitamins from foods. Meats, eggs, dairy, whole-grains, legumes, fruits and vegetables have a variety of B-complex vitamins, and if you include these in your diet you'll likely meet your needs. Foods especially rich in biotin include eggs, nuts, mushrooms, bananas and cauliflower.